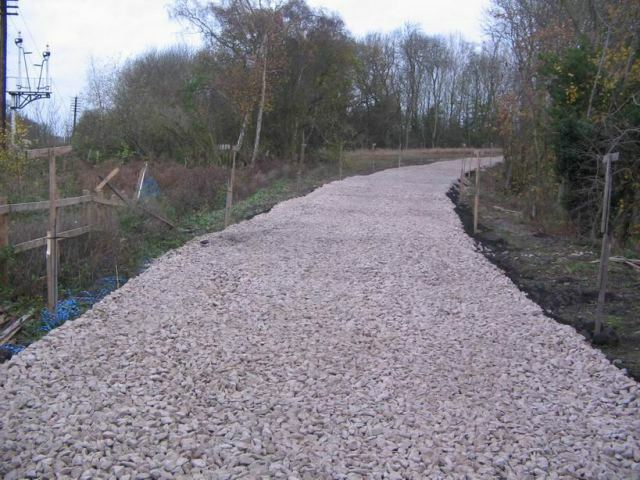 19th NOVEMBER 2009 - Branch Ballasting Completed! 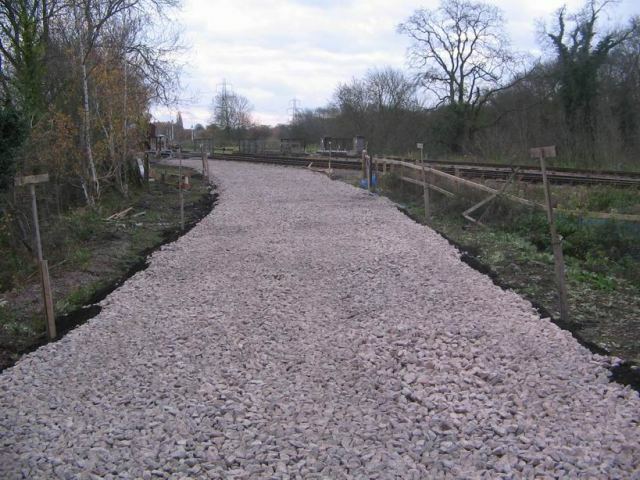 The laying of ballast on the final 300 yard part our section of the Mountsorrel Railway was completed yesterday. 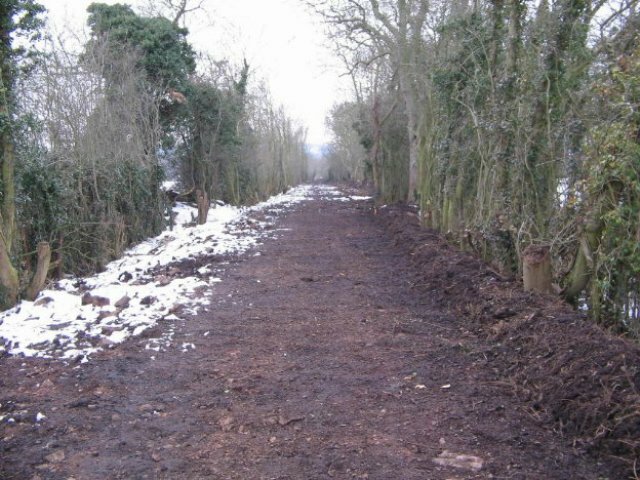 This completes the ballasted trackbed from the junction with the GCR at Swithland, throughout the whole of our section, ending 3/4 mile away on Lafarge property just short of Wood Lane bridge. As these photos show this creates a most impressive sight as the formation curves away from the GCR main line. Our sincere thanks to McCanns of Nottingham, who generously provided the plant used to lay the ballast at no cost. Our thanks also to Steve Cramp and the large volunteer team who have created not only this transformation, but also successfully encouraged the local community to get fully involved. 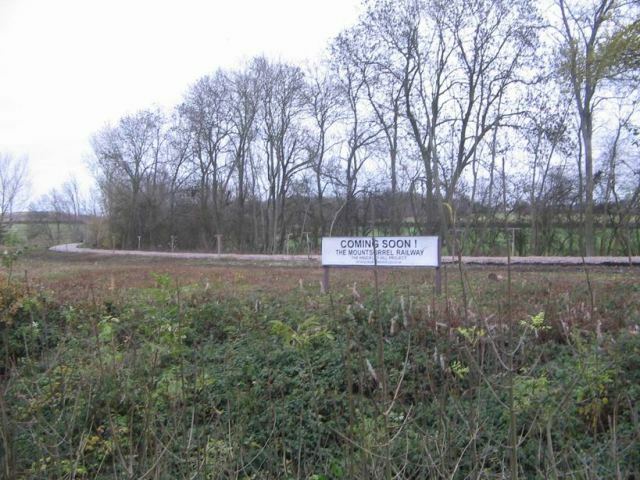 The result is remarkable and as the SIGN SAYS the Mountsorrel Railway is indeed coming soon! WE NOW NEED FUNDS - there is now nothing but cash stopping this becoming an operational branch off the GCR. We need between £60,000 and £80,000 to pay for track materials to lay track on the RVP section. The goodwill we've had so far has seen the project cost very littel to get this far, but we are unlikely to get track materials to this value donated. Please consider making a donation which can quickly be turned into real progress. Donations can be sent by cheque (payable to RVP Ltd, but write Mountsorrel Railway on the rear) sent to 26 Cliff Park Avenue, Wakefield, WF1 2DW or see the Mountsorrel Railway website for more detail on this project and ways to support it. NEW DIRECTOR Robert Parker was elected to the board. Robert joined us about a year ago and has assisted greatly in increasing the progress rate on buffet car 24278s restoration. He offered to join the board to improve communication with the regular volunteer teams at Rothley, something which is always difficult in volunteer groups made of individuals able to give differing amounts of time. We are sure Robert will be able to greatly improve this and his practical experience should also ease the pressure on other members of the team. NEW TREASURER Our long term treasurer, David Petterson, resigned from the board last year and progressively wishes to transfer his duties to others. Nick Mawby, an accountant by profession and previous volunteer with us, has kindly offered to take up the treasurers role and the process of transferring that responsibiliy has now begun. There should be no interruption as far as our ongoing activites are concerned. Donations will still be received in the usual ways and expenditure made through the established procedures; only the person behind the scenes will change. For the time being David Petterson retains his role as company secretary, and will continue advising us on legal matters. Of course, if anyone wants to take over these duties please step forward! We welcome both to the team and many thanks to our membership for the continued support and interest over the past year. The second (of three) Mountsorrel Granite Co Wagons has now been completed. As this photo shows this is a three plank and therefore has a slightly revised livery. Full detail and history of the wagon will follow in due course. 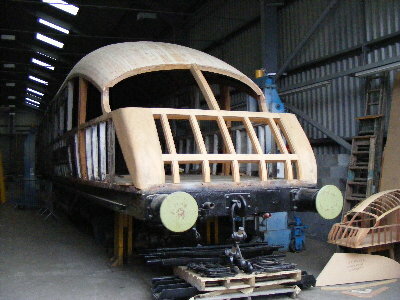 Behind the wagon (in the photo) buffet car 24278 continues to take great strides forward, now recieving coats of varnish. Also Rothley shed now has a fully functional CCTV system using the equipment donated by Loughborough University. GCR STEAM GALA - The GCR's major steam gala takes place this weekend (9/10/11th October) with an impressive line up of predominantly freight motive power and the usual intensive timetable. RVP plays its part with three TPO mail exchanges on the Saturday (10:30, 16:30 and 18:30 at Quorn), and two on the Sunday (times as the first two on Saturday). The BEAVERTAIL car will also be in use and available to passengers throughout the event. See www.gcrailway.co.uk for full details. 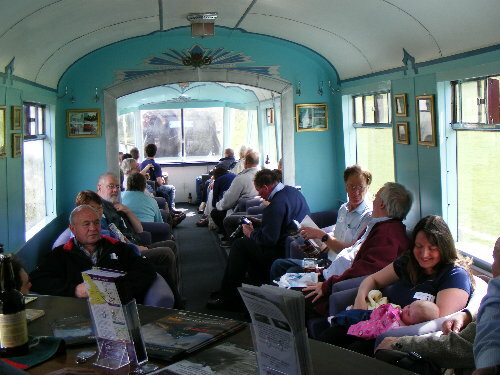 We will also have the LNER TPO set open for display at Quorn, the Mountsorrel Railway wagon on display at Quorn, and free bus connections for walking tours of the Mountsorrel branch. Finally our sales stand will be out - but we'd really welcome some help with this - any RVP members able to man the stand for a few hours over the weekend please contact info@rvp-ltd.co.uk. 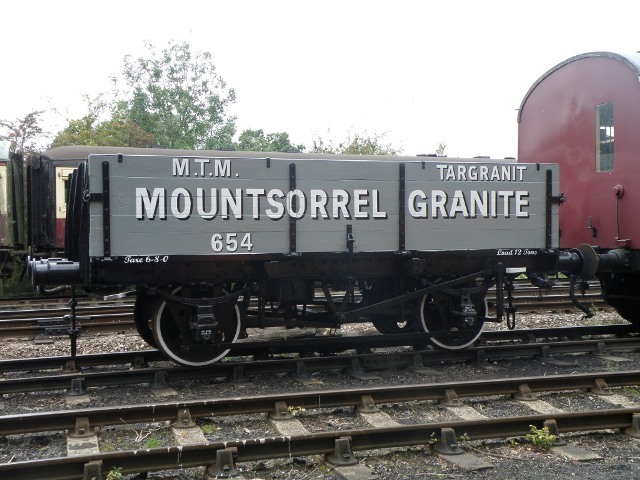 Detailed history of the Mountsorrel Granite wagon (B477060) is now on the vehicle history page. (Scroll to the bottom of the page when you reach that page). 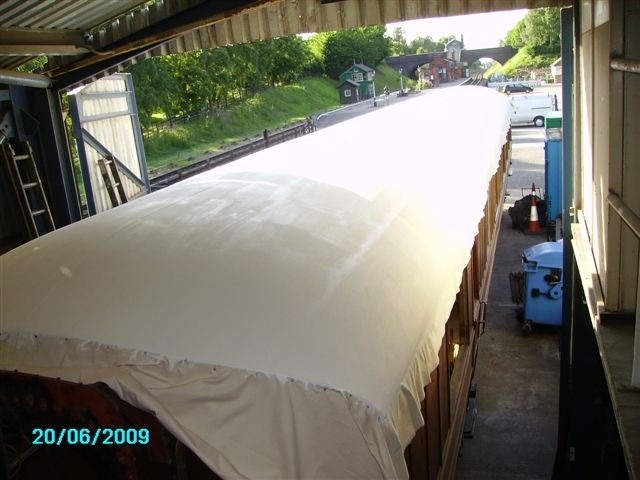 5th SEPTEMBER 2009 - MOUNTSORREL GRANITE WAGON COMPLETED! 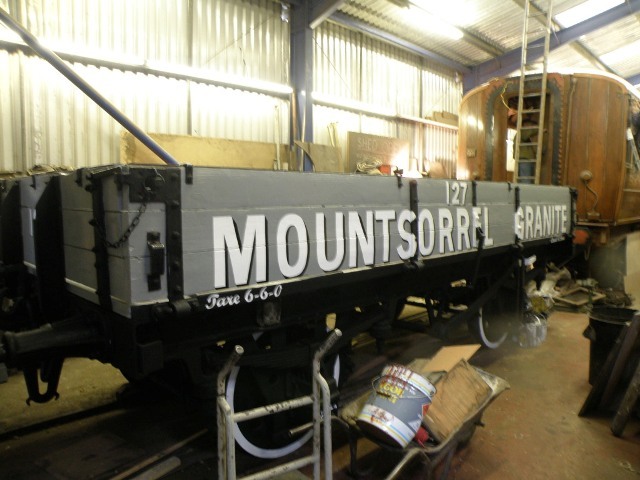 The first of three open wagons being repainted into Mountsorrel Granite Co. livery has been completed, as this photo shows. These wagons are being repainted to promote the project to rebuild the branch line; for the time being they will displayed around the GCR, but we obviously hope to use them on the branch they refer to in the not too distant future! 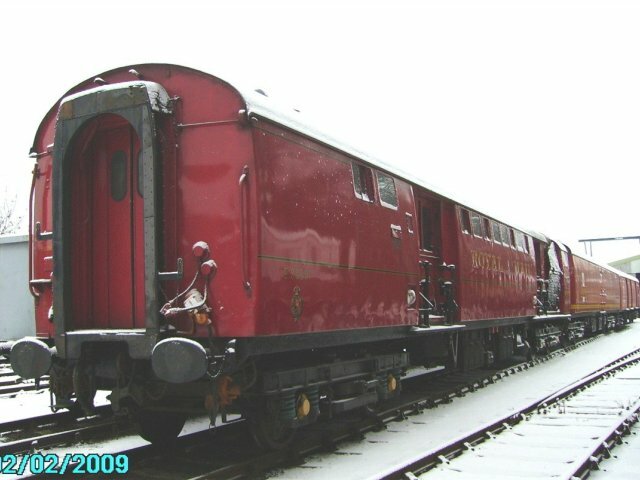 The livery details are accurate, based on photographs and the recollections of local people, and the quarry had many similar wagons in this livery which would have operated along the branch during its working life. However we should point out (for the historians out there) that the wagon itself is BR example which never carried this livery until now (details of the history of the wagon will follow shortly). Many thanks to the team of volunteers who produced this result, and also to the wagon owner for agreeing to its repainting. 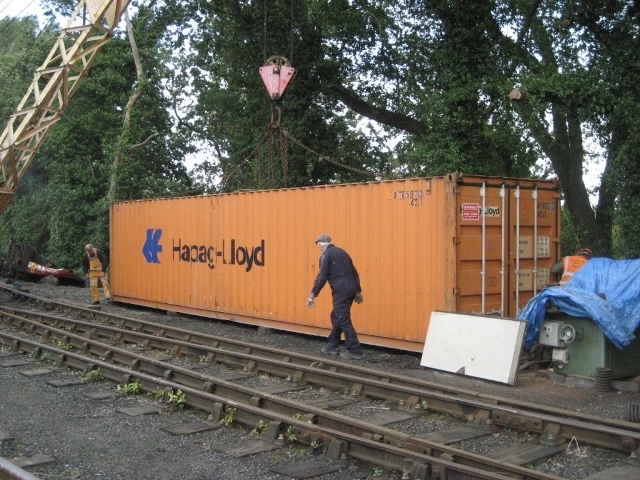 The tidying and re-organisation of Rothley yard took a major step forward today with the delivery of our new 40ft Container. This will be used to give us more working space, and we intend to repaint it to something a little less conspicuous! Various stores vans and containers were also moved both for RVP and the GCR - our thanks to all those involved for their co-operation in getting the site tidied. 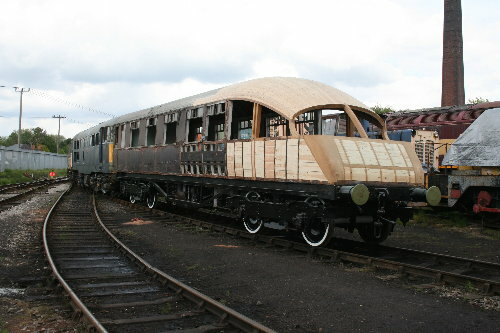 Meanwhile work continues on 24278 - the interior seeing great activity with the ceiling panelling now being fitted. 2nd AUGUST 2009 - 1V86 TPO COMPLETED!! The Mail by Rail gala last weekend included the speical diagramming of Peak D123 to work the four vehicle Mark 1 TPO set. This was to mark the return to service of the complete train, a significant milestone in this important project. 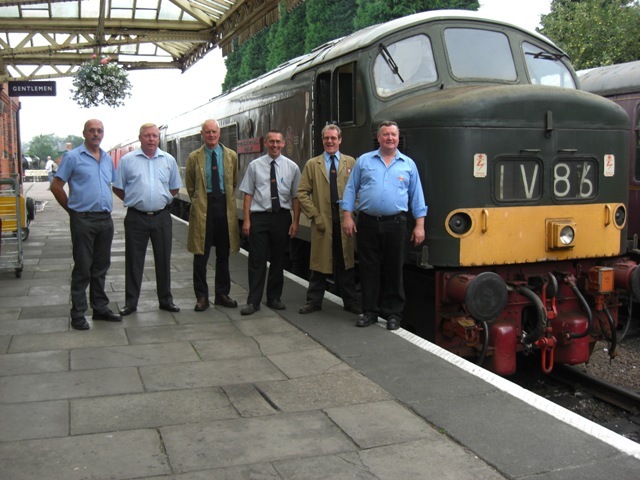 As you may know the group restoring the vehicles chose the title "1V86 TPO Group" in memory of the overnight Newcastle - Plymouth mail train of the recent past. Peaks were regularly diagrammed for this train which was, of course, formed of Mark 1 TPO vehicles (In particular 80349 was certainly used on this route recent past). 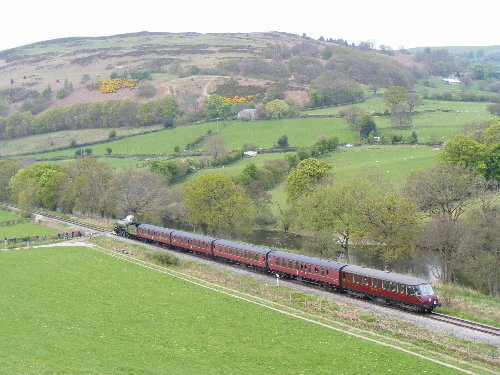 To mark the event the Peak ran with the headcode 1V86 on the Sunday morning of the gala - as the photos show. Congratulations to the team involved in getting the train to this stage and our thanks to those donors who made it possible. The work isn't quite complete, and work to repaint the three vehicles currently carrying faded red livery will start shortly. 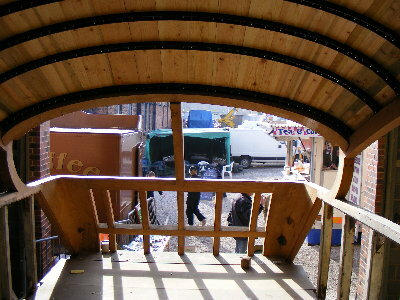 The finished set is expected to be unveiled in early 2010. 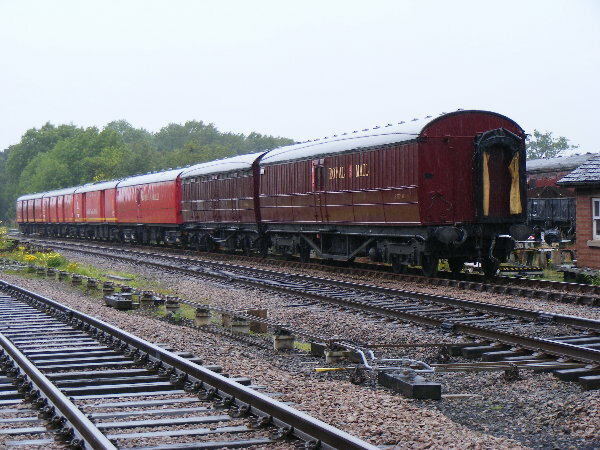 After the gala the Mark 1 set was added to the LNER pair for a shunt move to Swithland yard. As far as we know this is the first time all of our TPO vehicles have been formed into one train (and this is not likely to occur during any event since LNER and BR TPO vehicles would never have run together in normal service). It does make an impressive sight though as these photos show. Finally we must acknowledge our thanks to LOUGHBOROUGH UNIVERSITY who have donated a complete security camera system; we intend to install this at Rothley shed in due course. MAIL BY RAIL - 25 and 26th JULY - This will feature the first runs of the complete 1V86 Mark 1 TPO set; the only time they will run together in their current liveries before repainting in 1960s style. 4 TPO drops each day, and an intensive passenger service including the Beavertail. LNER TPO set and museum on display at Quorn. More details on the GCR website (see links page). WEBSITE DISRUPTION - Yahoo are no longer providing free webspace from the Autumn. As a result (and as we don't want to pay!) the web site has to be moved to a different supplier. Updates between now and October will be limited to just this news page. However the site should continue to function and, after the move to a new host, will retain the same web address. Hopefully we'll then have space to add a back log of photos which we've not been able to use because of lack of space. WORK WEEKEND has just passed and successful achieved its main aims - 24278 now has a new roof canvas fitted and painted. BZ 70654E has also had its roof repaired and repainted ready for a bodyside repaint shortly. Finally some tidying of Rothley yard as completed to allow some work to begin to improve the facilities there. 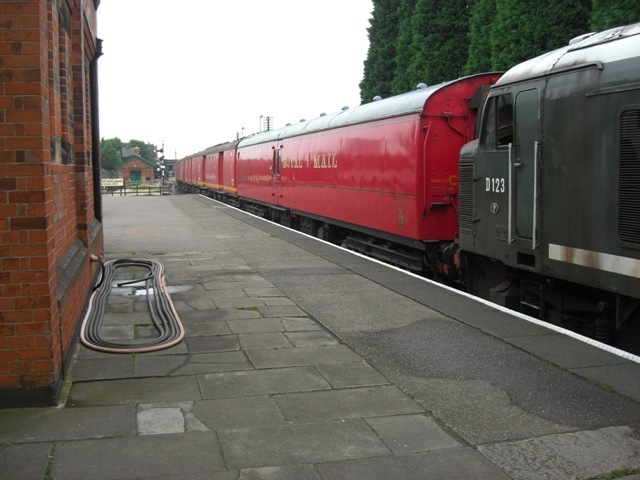 WORK WEEKEND 2009 - We are holding a work weekend at Rothley on Saturday / Sunday 20/21st June. This is primarily to get 24278s roof canvas fitted to allow it to go outside for a while. This is important since we need shed space to clear a backlog of other work. We really do need as many volunteers as possible to achieve this, and a host of other work. If can make it please turn up; there will also be a social event on the Saturday evening - contact Darren for details. GCR "Mail By Rail" gala - is this year on 25/6th July. 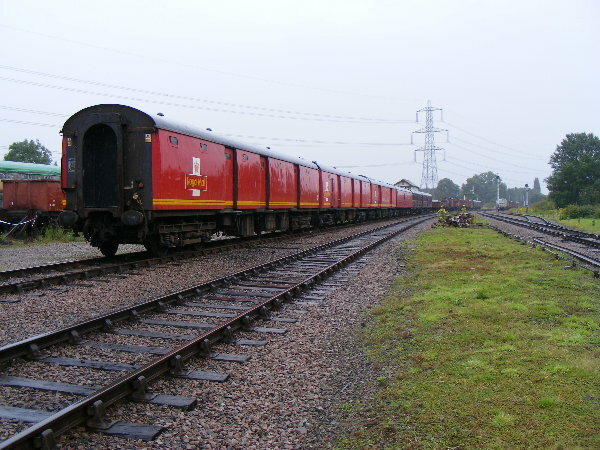 The complete 1V86 Mark 1 TPO train should make its debut at this event, with four mail exchange runs each day. LNER TPO set also on display at Quorn, and a frequent timetable of passenger trains. More details to follow, but put the date in your diary. Our thanks to the Bretton Grange society and the Llangollen Railway for making this trip possible and for their hospitality during the week. Thanks also to those RVP members who helped with the sales stand, and those who supported the event by visiting as paying customers (and one who did two days working in the beer festival rather than drinking in it!). The first of three wagons have arrived at Rothley for rebuild and repaint into full Mountsorrel Granite Co Livery for use as part of the rebuilding of this branch line. 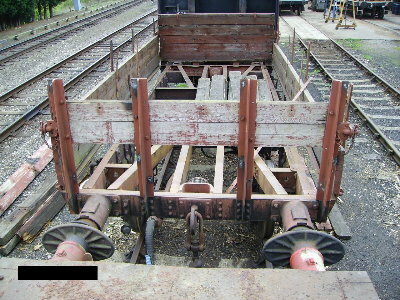 The first wagon is 5 plank B477060. 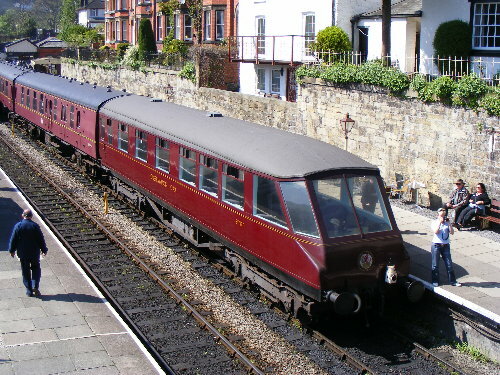 This is a BR built wagon resident on the GCR for some time, but selected because of its similarity to those which ran in this livery in earlier years. 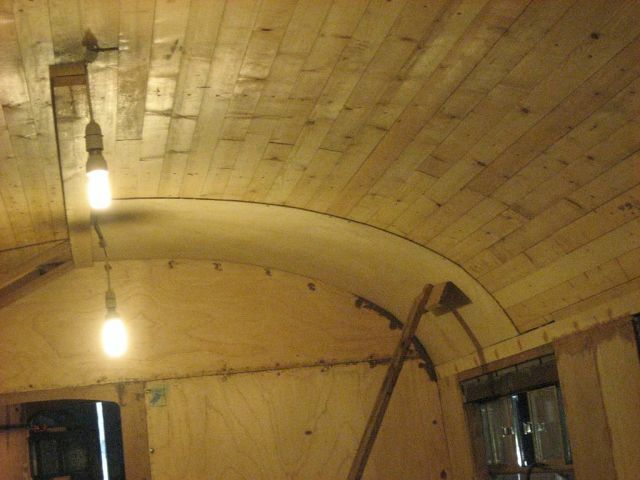 The wagon is owned by Nick Tinsley, who has kindly agreed to its use for the project. It is hoped that the costs of the work will be covered by a grant application. As the pictures show the work is extensive and is being carried by the branch restoration team. BOOKS WANTED! - Our sales stock is getting low. The one thing that sells very well is second hand railway books. If you have any you no longer need and would be willing to let us have please get them to Rothley or e-mail rvp_ltd@btinternet.com and we'll see if we can arrange collection. 1729 made its guest appearance at this LNER themed event - showing the original Beavertail end shape for the first time in 50 years. This is the only place you will see a clear shot of the end, showing the impressive end framework made from solid teak; if only we had a pound for everyone who stroked it! This is the view from inside showing just how restricted the view from the end was compared to the rebuilt version - within a few years passengers will be able to compare the two! 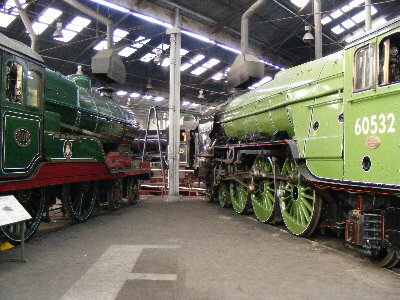 For the loco fans we came across an old friend; "Butler Henderson" posed in the shed alongside "Blue Peter". Our thanks to Barrow Hill for inviting us to what appeared to be a hugely successful weekend. THE RVP ROADSHOW sets off this Saturday for Barrow Hill. Beavertail Car 1729 will be making its first public appearance for well over 20 years at the major gala event there this weekend 4/5th April. The coach framework to the original shape is now complete and the vehicle should be back on its bogies just in time for the event. It will be accompanied by our new display boards and sales stand. If you are visiting this high profile event please do come and see the progress on what must rank amongst one of the most striking carriage rebuild projects ongoing at the moment; and highly appropriate to an LNER themed event. The following weekend (Easter) its sister vehicle, 1719E, will be in use on the GCR. Immediately after that it leaves for its holiday in wales. 1719E will be appearing at the "Steel, Steam and Stars" gala on the Llangollen railway from 18th to 26th April. In regular use on this stunningly scenic line the Beavertail is expected to be a very popular addition to an impressive line up of locomotives. Expected to be in use every day (except Monday and Thursday) our display and sales stand will also be accompanying it during the weekends (probably at Llangollen station). We still need volunteers to man the latter, contact us if you can help out. RVP ON TOUR 2009! - This year we are pleased to be involved in two events away from the GCR. Firstly our second BEAVERTAIL car 1729 is located at Barrow Hill Railway Centre (Chesterfield), where its major restoration is ongoing. This is progressing well (although far from complete!) and the vehicle will be on display to the public (for the first time in well over 20 years) at the major LNER Gala event on 4th/5th April. This gala features many well known LNER locomotives including "Tornado", and 1729's appearance there will be highly appropriate. We will have a display stand alongside the vehicle, and volunteers are needed to staff this (there may be a limit on numbers - if you are interested please contact Darren asap). Two weeks later (starting 18th April, and running for 10 days) our other BEAVERTAIL, restored number 1719, will be having a working holiday at the Llangollen Railway steam gala. More details of this to follow shortly. Its been a while since the last update on this project, but this doesn't mean nothing is happening. 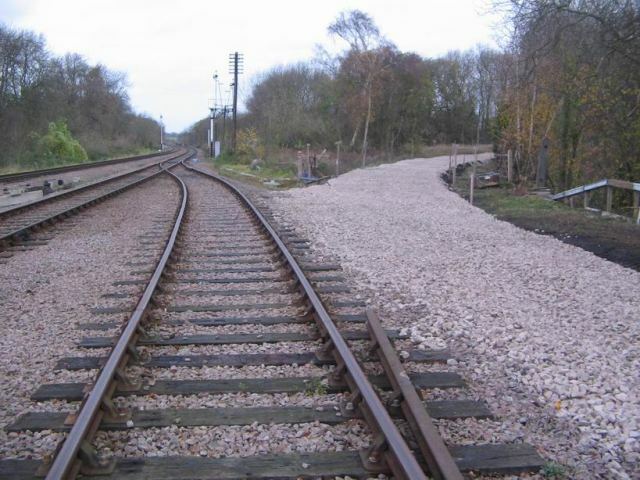 Over recent months the trackbed has seen continued preparation ready, which has culminated recently in the removal of the top surface of accumulated mud, revelaing the original ballast base beneath. This now gives the trackbed its final appearance before the laying of some additional ballast and then the track. 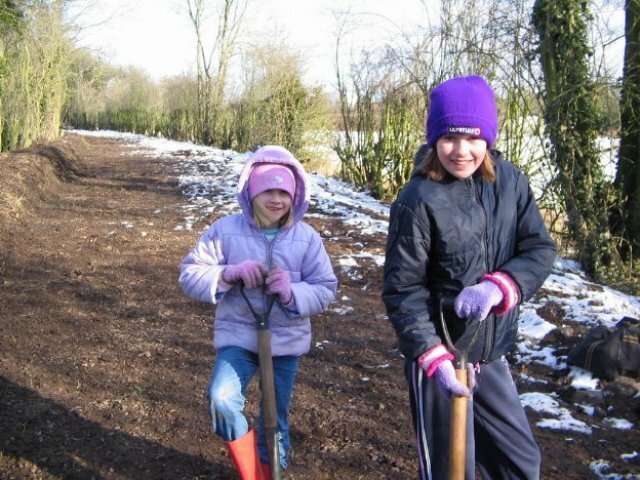 So determined are the volunteer team that the work continued throughout the recent bad whether - and here's the evidence! 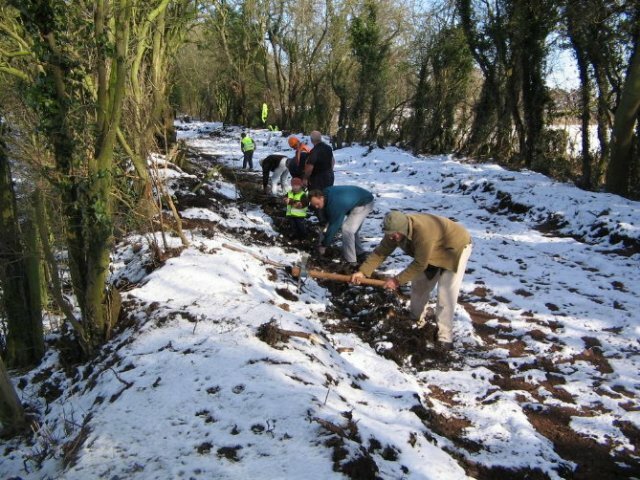 A novel development for the project is the involvement of local schools in some elements of the work - culminating shortly in an "Archaeological" dig in an area where we believe some original rail chairs are still located. While this is unlikely to find any valuable treasure (as far as we know!) it does serve a real purpose in bringing local history to life for the children. This, and the involvment of local ecological groups, has led to the project taking an increasing importance in the local community. We have always been determined to demonstrate that the branch does not conflict with the desire of the local community to see ecology preserved and hopefully direct involvment will ensure that aim is met (a large part oft he site being undisturbed by the works and consisted of ecology rich woodland). 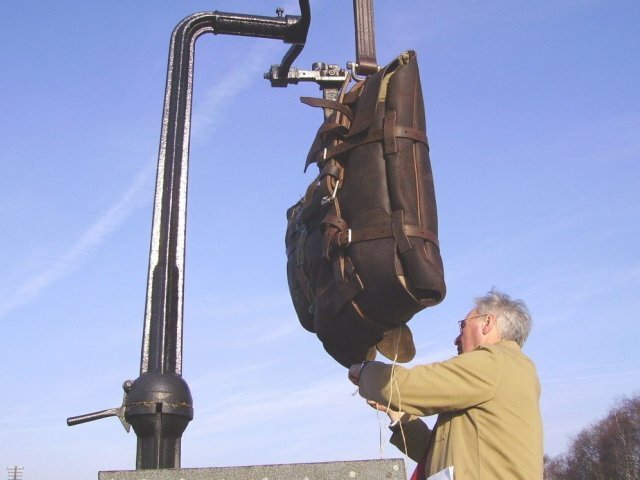 Anyone who has seen a mail exchange at Quorn will know that the leather pouches used take quite a pounding. Our collection of six were original ones used in BR days, and we've now used them for 27 years on the GCR. They are therefore very tired and have been constantly patched up to keep the show on the road. Looking ioncreasingly tatty we have tried for several years to find leather workers willing to make a new set, but our efforts always came to nothing because of the one off nature of these items. Now however we have found a saddler willing to make not only the pouch, but also a full set of straps. Furthermore a prototype has now been made and tried out with no problems at all - as this photo shows. The cost is not cheap; the prototype cost £750 paid for by donations to the collecting bucket at Quorn and a grant from Leicestershire County Council (to whom we record our thanks for their continued support). We can now announce that a further five pouches have now been ordered to make a complete new set. 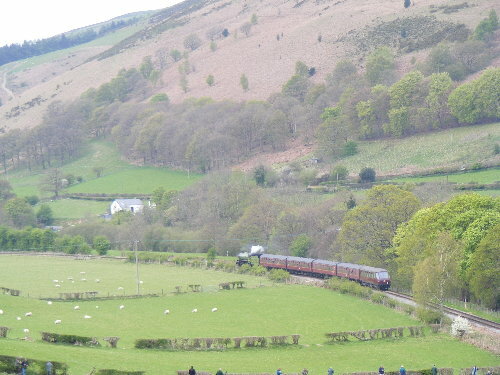 The cost will largely be covered by a grant from the GCR's supporting charity, the David Clarke Railway Trust. Once again we record our thanks to the DCRT for their support which will allow us and the GCR to continue these spectacular demonstrations for many years to come. The weekend past saw the first runs in preservation for our Brake Tender 80458, and therefore the first time an entire Mark 1 TPO vehicle train has operated on the GCR (although only three vehicles at this stage). 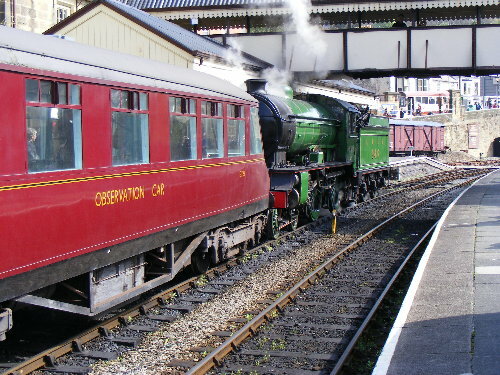 It also saw the debut of "Oliver Cromwell" on TPO's - as this photo shows, with the train racing along the Quorn straight. By monday, with heavy snow, the stabled set presents a christmas card scene at Rothley yard. Our thanks to all involved in rescuing and restoring the mark 1 TPO vehicles, and those who donated to the appeal two years ago. 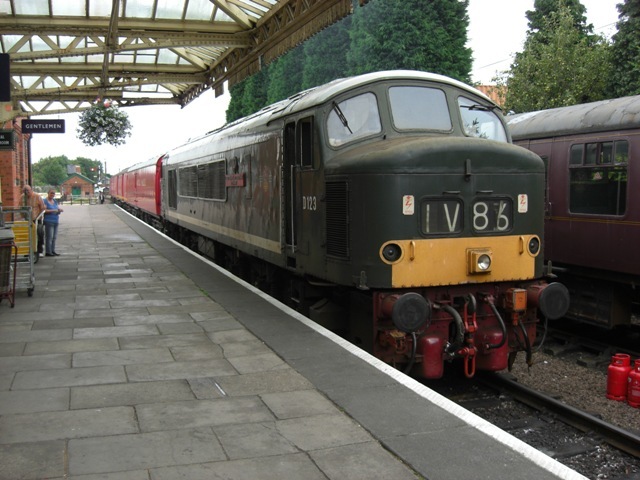 Donations are still welcome to assist with the cost of repainting the set in 1960's livery. BEAVERTAIL 1719 BADGE - This a quality enamel badge featuring the Beavertail in its Maroon livery as currently running. These really have turned out very well - available at £3.50 (inc postage). STOCKBOOK - A glossy 40th Anniversary reprint of our stockbook - fully updated and in full colour (for the first time ever) - £5 (inc postage). Both items available by post - cheques payable to RVP Ltd (sent to 26 Cliff Park Avenue, Wakefield, WF1 2DW), or payment can be made by Pay-pal (e-mail rvp_ltd@btinternet.com with your order and payment details will be come by return). Both items will also be on the sales stand at Rothley next weekend. 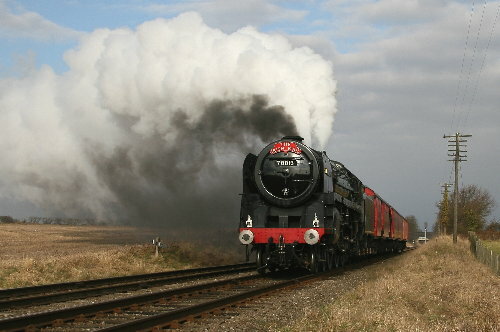 WINTER GALA - The GCR winter gala takes place this year on 31st Jan / 1st Feb. There will be two mail exchange runs each day (late morning and late afternoon), including the debut of "Oliver Cromwell" on a mail train. Rothley shed will be open for visitors and the sales stand will be out. HAPPY NEW YEAR - Our annual dinner will take place this year on Sat 31st January (8pm) at the Great Central Hotel, Loughborough. If you wish to join us the cost is £15 and the menu is Attached Here. Please e-mail rvp_ltd@btinternet.com before 21st Jan if you want to reserve a place. This date is the Saturday of the GCR winter gala, during which our TPO set will be performing mail exchanges and Rothley shed will be open to the public.